With her undisclosed agenda well hidden beneath Aqua Net, Maybelline, and leather, Monty plays the part of groupie with finesse, never suspecting that her rocker crush has a few tight-lipped secrets of his own…secrets that make hers seem like child’s play…secrets that could change Monty’s life forever. This book took a while for me to get into. I had to put it down for a while and then pick it up later and give it a second go round. 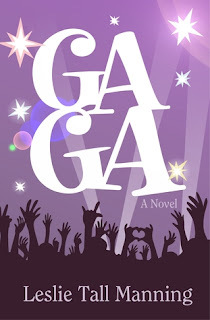 Once I was able to change my mind set and accept that GaGa was a simple, fun read, which at times would make me accept that which was hard to accept, I was able to get into the book and actually enjoy it. When Monty’s husband decides to end their marriage she is presented with, what many would say, is the adventure of a lifetime, the opportunity to be someone else. To be a thirty something groupie (even though she is in her mid-forties), and follow your teenage crush on the road and get paid to do it! I do appreciate Leslie Tall Mannings desire to present to us a character, Monty, who through her experience transforms from a mild, non-adventurous character, to a woman who really explores who she is and what it is that she is capable of, independent of her husband and her status quo everyday life. I would have enjoyed this novel more if it had been a little more relatable and realistic. Many times when you read a novel you find a way that connects the main character to yourself, whether it be through experiences they have that are similar to ones you have gone through, or you share the same religion or family background. In GaGa it was hard to connect to the main character and I think this made it hard to initially get drawn into the book. I would give this book 3 stars out of 5 as it was light, entertaining and didn’t require a lot of time or emotion to be invested into it. It did start out slow and at times seemed repetitive and mundane, but got more realistic and somewhat more relatable the more it went along.